This past weekend, I went on a journey to the fringes of the TransLink service area, to board the Albion Ferry in its final week of operation. With the opening of the Golden Ears Bridge, the 52-year old ferry service will cease operations at the end of the month. I planned this trip to include a trip on the new bridge via route 595, which links Langley Centre and Haney Place. At the last minute, I added a lengthy side-trip to Downtown Vancouver to check the open house for the new City Centre Station of the Canada Line. This would likely be the last such event before the whole line opens sometime in August. Living in Vancouver, just getting to Langley is an adventure in itself. I made my way to SkyTrain, which I then took to 22nd Street. I like to think of this station as a regional hub. From here, bus routes fan out to South Vancouver, central New West, Richmond, Annacis Island, North Delta, and even Langley’s Walnut Grove Park & Ride. 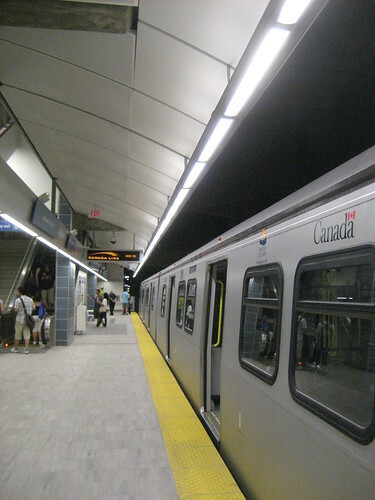 The 595 Langley Centre/Haney Place is the latest example of the regional links that TransLink has implemented in recent years. Acknowledgement of the end of the Albion Ferry. This can be found on both docks. From the Fort Langley side, it’s about a 1-km walk to the village proper, with the National Historic site nearby. The main drag, Glover Road, has a pleasant mix of shops and eateries. After making my way back to SkyTrain (via Langley Centre), it’s off to downtown, and the preview of City Centre Station. Looking at the train that would be heading to Richmond or YVR. A few more photos, including large versions of those shown here, are in my flickr set.